I’ve never been to Paris. But as a student and teacher of popular culture, and an ethnomusicologist overwhelmed today by the vast promise of those songs which pay tribute to the city of lights, I recognize its power as a symbol of all that is unfettered and alive: the intellectual late-night salon, the bright Eiffel tower, the arts and culture that live in our hearts. As I suggest to my media literacy students when we study the tragedy of September 11, New York has long stood as a symbol of a particular cultural mindset, too, with the twin towers serving once upon a happier time as a focal point for the might and majesty of the dream. When Jon Stewart, in his incredible, tearful opening sally after a month off the air, noted that the terrorists who transformed the skyline outside his apartment window left a clear view of the Statue of Liberty in its place, he, too, was dealing in the coin of symbols – and reinforcing the connection between New York and France that lives proud in our lady of the harbor. To visit the Statue of Liberty is not to admire the patina, but to embrace the symbolism of a country that once proudly welcomed every member of the huddled masses, promising freedom. I imagine, today, that climbing the Eiffel Tower has long served as a similar exercise: not to mount the heights, but to realize them. Of course, the distance between symbol and streetlife is as stark in France as it is in the states. Even as the abstraction of the symbol makes it a target for those who oppose our vision, the destruction of those symbols breaks the barrier between the abstract and the alive. And so, watching the footage of last night’s attacks, I am struck by how real everything is. The scenes from the streets and alleyways show a chaos that cannot be reconciled with our romanticism. The aftermath of tragedy is dark and sad. Hope is hard-won, here where the news streams to every corner of the frayed and tattered world, to find us weary with such attacks, and angry at those who would utilize them to speak their concern about the world-as-it-is. Our hearts are heavy, and the cries for revenge are strong and sour in our mouths. To live in a place that is a symbol is risky business, these days. Maybe it always has been. But days like today remind us, too, how strong we must be in protecting our symbols, simply by living the dream itself, that we might continue to hope, to work for a world in which the bright days we imagine can be more than just moments too easily lost to the winds of change, the whims of chaos. To those who suffer in the wake of tragedy, know that we stand with you in alliance to both the symbolic and the real: with freedom, to liberty, and in sorrow. And to those billions who watch from afar, may we remember our charge, and stay true to ourselves as we react to yet another attack on our values. Cover Lay Down shares new features and coversets here, on Facebook, and at our Unity House Concert series throughout the year thanks to the support of donors like you. Coming soon: current students and recent graduates of the Berklee College of Music take on bluegrass classics, plus covers of The Beatles, Gillian Welch, Rod Stewart, Iron & Wine and more! You say that it is dangerous to live in a symbol. That may be true but if your home town is a symbol to others, it’s probably just home to you. I’ve been to Paris several times, as I live not so far away, and it is and will always be a beautiful and real city, full of tourists ok, but also Parisians of all sorts getting on with their lives. 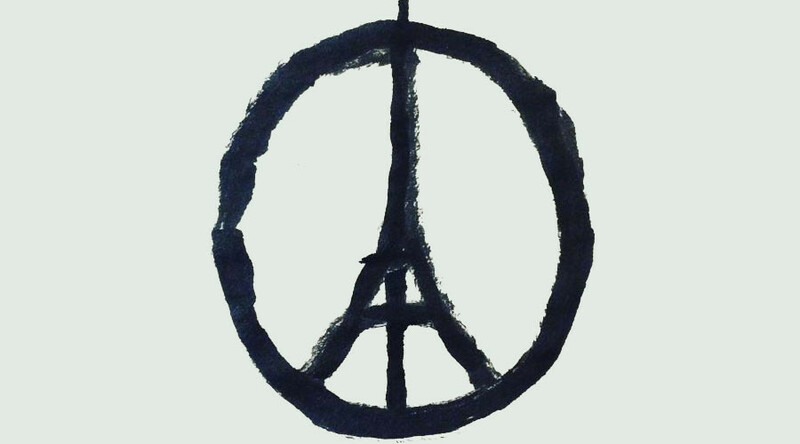 I am sharing the grief of Paris but we mustn’t let terrorists get the better of us.